The following is a picture of P46. “P” stands for papyrus. 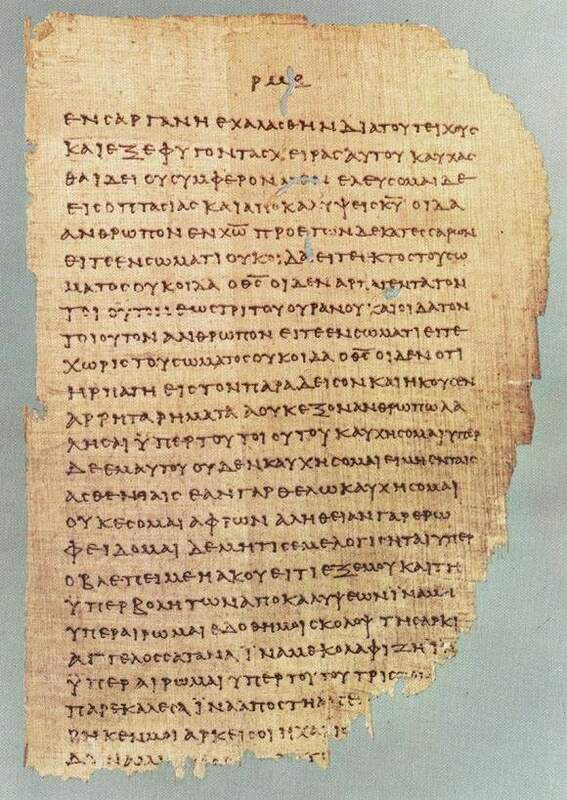 Extant (text that has survived from the past to the present time) Biblical fragments have numbers associated with them to differentiate them from one another, in this particular case, the number 46. P46 contains almost all of 1st and 2nd Corinthians and 5 other epistles (letters) too. The letters (1st & 2nd Corinthians) are written by a Rabbi that was also a Pharisee – a Pharisaical Rabbi that studied at the feet of another Pharisaical Rabbi who was also the Nasi (President) of the Great Sanhedrin in Jerusalem – considered one of the greatest teachers in Jewish history and who was also a grandson of Hillel, another great teacher in Jewish history. Love your neighbor as yourself – this is the whole Torah – the rest is just commentary – go and learn it. my advice to you is not to interfere with these people, but to leave them alone. This Pharisaical Rabbi that wrote these two letters to the Corinthians (and 2 more letters that are referenced in these letters but lost to us) and studied at the feet of Rabban Gamaliel the Elder is the Rabbi Sha’ul (Paul) of Tarsus. He is doing what Rabbis did and do in writing these letters to the Corinthians: correcting wrong thinking and wrong doing. 1 Corinthians 3:1-3 (CJB) 1 As for me, brothers, I couldn’t talk to you as spiritual people but as worldly people, as babies, so far as experience with the Messiah is concerned. 2 I gave you milk, not solid food, because you were not yet ready for it. But you aren’t ready for it now either! 3 For you are still worldly! Isn’t it obvious from all the jealousy and quarreling among you that you are worldly and living by merely human standards? Ironically, many modern churches model themselves after the Corinthian church – arguably the most worldly of all of the churches in the text. The following are the quotes from the TaNaKh (Old Testament) in the Brit Chadashah (New Testament) letters of 1st Corinthians and 2nd Corinthians. for in these things I take pleasure,” says Adonai. You work for him who waits for you. 1 Corinthians 2:15 (CJB) 15 But the person who has the Spirit can evaluate everything, while no one is in a position to evaluate him. For who has known the mind of Adonai? But we have the mind of the Messiah! Isaiah 40:13 (CJB) 13 Who has measured the Spirit of Adonai? and foiling quickly the plans of the false. are merely a puff of wind. 1 Corinthians 5:13 (CJB) 13 God will judge those who are outside. Just expel the evildoer from among yourselves. Deuteronomy 13:5 (CJB) 5 and that prophet or dreamer is to be put to death; because he urged rebellion against Adonai your God, who brought you out of the land of Egypt and redeemed you from a life of slavery; in order to seduce you away from the path Adonai your God ordered you to follow. This is how you are to rid your community of this wickedness. Deuteronomy 17:7 (CJB) 7 The witnesses are to be the first to stone him to death; afterwards, all the people are to stone him. Thus you will put an end to this wickedness among you. Deuteronomy 19:19 (CJB) 19 you are to do to him what he intended to do to his brother. In this way, you will put an end to such wickedness among you. Deuteronomy 21:21 (CJB) 21 Then all the men of his town are to stone him to death; in this way you will put an end to such wickedness among you, and all Isra’el will hear about it and be afraid. Deuteronomy 22:21 (CJB) 21 then they are to lead the girl to the door of her father’s house, and the men of her town will stone her to death, because she has committed in Isra’el the disgraceful act of being a prostitute while still in her father’s house. In this way you will put an end to such wickedness among you. Deuteronomy 22:24 (CJB) 24 you are to bring them both out to the gate of the city and stone them to death — the girl because she didn’t cry out for help, there in the city, and the man because he has humiliated his neighbor’s wife. In this way you will put an end to such wickedness among you. Deuteronomy 24:7 (CJB) 7 “If a man kidnaps any of his brothers, fellow members of the community of Isra’el, and makes him his slave or sells him, that kidnapper must die; in this way you will put an end to such wickedness among you. 1 Corinthians 6:16 (CJB) 16 Don’t you know that a man who joins himself to a prostitute becomes physically one with her? For the Tanakh says, “The two will become one flesh”; Genesis 2:24 (CJB) 24 This is why a man is to leave his father and mother and stick with his wife, and they are to be one (‏אֶחָד‎ ʾechādh) flesh. If God is concerned about cattle, Deuteronomy 25:4 (CJB) 4 “You are not to muzzle an ox when it is treading out the grain. “The people sat down to eat and drink, then got up to indulge in revelry.” Exodus 32:6 (CJB) 6 Early the next morning they got up and offered burnt offerings and presented peace offerings. Afterwards, the people sat down to eat and drink; then they got up to indulge in revelry. for the world is mine, and everything in it. Psalm 89:11 (CJB) 11 The heavens are yours, and the earth is yours; you founded the world and everything in it. I will speak to this people. we’ll fill up on good, strong liquor! so that he became a living being. “Death is swallowed up in victory. Isaiah 25:8 (CJB) 8 He will swallow up death forever. the disgrace his people suffer. 1 Corinthians 15:55 (CJB) 55 “Death, where is your victory? Death, where is your sting?” Hosea 13:14 (CJB) 14 Should I ransom them from the power of Sh’ol? Should I redeem them from death? where is your destruction, Sh’ol? My eyes are closed to compassion. what he had been ordered. on the day of salvation, I will help you. and I will walk among you. and they will be my people.” Leviticus 26:12 (CJB) 12 but I will walk among you and be your God, and you will be my people. Exodus 6:7 (CJB) 7 I will take you as my people, and I will be your God. Then you will know that I am Adonai your God, who freed you from the forced labor of the Egyptians. Jeremiah 31:33 (CJB) 33 “For this is the covenant I will make with the house of Isra’el after those days,” says Adonai: “I will put my Torah within them and write it on their hearts; I will be their God, and they will be my people. Jeremiah 32:38 (CJB) 38 They will be my people, and I will be their God. Ezekiel 37:27 (CJB) 27 My home will be with them; I will be their God, and they will be my people. don’t even touch what is unclean. Then I myself will receive you. says Adonai-Tzva’ot.” Isaiah 52:11 (CJB) 11 Leave! Leave! Get out of there! you who carry Adonai’s temple equipment. Ezekiel 20:41 (CJB) 41 I will accept you with your sweet aroma when I bring you out from the peoples and gather you out of the countries where you were scattered; and through you I will manifest my holiness in the sight of the nations. 2 Corinthians 8:21 (CJB) 21 for we take pains to do what is right not only in the sight of God but also in the sight of other people. Proverbs 3:4 (CJB) 4 Then you will win favor and esteem in the sight of God and of people. 2 Corinthians 9:7 (CJB) 7 Each should give according to what he has decided in his heart, not grudgingly or under compulsion, for God loves a cheerful giver. Exodus 25:2 (CJB) 2 “Tell the people of Isra’el to take up a collection for me — accept a contribution from anyone who wholeheartedly wants to give. His power will be increased honorably. 2 Corinthians 13:1 (CJB) 1 This will be the third time that I have come to visit you. Any charge must be established by the testimony of two or three witnesses. Deuteronomy 19:15 (CJB) 15 “One witness alone will not be sufficient to convict a person of any offense or sin of any kind; the matter will be established only if there are two or three witnesses testifying against him. This entry was posted in Verses and tagged 1 Corinthians 3, 1st Corinthians, 2nd Corinthians, Acts 5, bible, Brit Chadashah, church, comparison, Extant, fragment, Gamaliel, golden rule, Great Sanhedrin, Hillel, Jerusalem, Love your neighbor as yourself, Nasi, New Testament, Newer Covenant, Old Testament, old testament references in new testament, Older covenant, oldest, our master, p46, Papyrus, paul, Pharisee, President, Rabban, Rabban Gamaliel the Elder, rabbi, Sanhedrin, Sha"ul, Shammai, Tanakh, Tarsus, torah, verse, verses., worldly. Bookmark the permalink. Wow. That’s something to see them all lined up! 🙂 I plan to have them all done soon – they are in the verses folder to the right. I enjoyed this….thanks for posting. Easy to read and follow.